You wish to celebrate your next private party at the Hotel Kaiserhof Muenster? Great! We offer a perfect setting for any occasion. Our event team will organize your party. We think of everything: professional reception of guests, individual table decorations, personalized menu cards and everything else you need for your event. 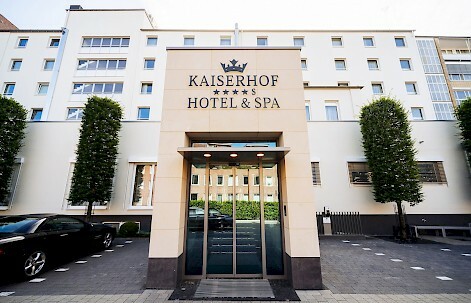 In the familiar atmosphere of the Kaiserhof and in our stylish function rooms for 10 to 100 persons you and your guests will immediately feel comfortable. Celebrate the most beautiful day of your life in the Kaiserhof. Invite your guests for a lunch or dinner after your civil wedding ceremony or a lavish party with dancing after the wedding in church. We help to arrange your wedding day individually and personally. A long, festively decorated table, plus a creative menu or buffet with culinary surprises and for dessert, a big birthday cake. Your classic birthday party could be like this. Looking for something special? For small groups of 10 to 20 people, we offer private wine-tastings and whiskey-tastings. Celebrate relaxed in the Kaiserhof Beauty & Spa. A "Spa Day for friends" or an individually assembled spa day makes as much fun. For baptisms as well as celebrations of the Holy Communion and confirmation the Kaiserhof Muenster also offers an attractive location. Lunch or coffee table? We will make you an individual offer. As a family run hotel one thing is very important to us - the familial dealing with clients, colleagues and employees. Feel yourself at home and rest assured that we are as passionate about your family celebration as you are! When planning your celebration, we offer you advice and assistance. We talk about menus and buffets, festive decorations and - on request - personalized menu cards. For the family members who have a long journey, we are happy to provide cozy rooms. You are alumni of the Westphalian Wilhelms-University (WWU)? Of course, we also offer you deals for your alumni networking. The WWU is one of the best universities in Germany. Even after the successful completion of their studies many students remain in contact. For these alumni meeting the Kaiserhof offers numerous deals. Make your parties more fun! You can extend all your celebrations with out of the ordinary supporting programs. Please ask as for recommendations. Of course, our function rooms can also be used for business events in Muenster. Whether you plan a Christmas party, a company party or a kick-off event - the individual rooms are suitable for small and large parties up to 100 people. For more information, please visit our site "business celebrations".